1 side openings to the side of a top opener above a direct glazed section. Large side opening is on the left when viewed from outside. 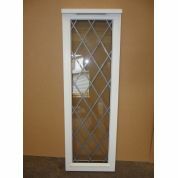 If you pay for delivery, these windows will be delivered direct from our supplier and will arrive to you fully boxed. This can only be done for mainland locations. They will call you to organise a day and time of delivery. Alternately, they can be delivered to our premises for you to collect.